You might be surprised at how many wheelchair accessible trails there are on the Peninsula and in the South Bay. There certainly could be more, but we’re lucky to have many places that are Americans with Disabilities Act (ADA) compliant, suitable for all abilities, and great for strollers, walkers and anyone looking for a less strenuous trail. 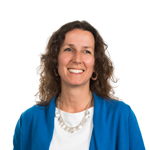 There are also many organizations and bloggers in the Bay Area that have created helpful resources on wheelchair accessible and easy access trails (see below). The hard part is narrowing down the trail options enough to know where to go and when. We’ve compiled three wheelchair accessible trails that we at POST are particularly proud of because they take you through or near open spaces we’ve protected. Since 1977, we’ve been hard at work protecting the open spaces of the Peninsula and South Bay, conserving over 76,000 acres of land in that time. Part of our goal is to connect people like you to the outdoors, providing you an escape from your everyday life with the wide-open spaces of this special corner of California. Below you’ll find information on our three favorite accessible trails. They are special places to many of our staff and, with some exploring, I hope they will become special for you too. Happy trails! Overview: Wind along the coastal bluffs of POST-protected Pillar Point for views of the Pacific, including the world-famous Mavericks surf break. The Jean Lauer Trail, named after a former POST staffer, winds through the windswept bluffs of Pillar Point, just north of Half Moon Bay. 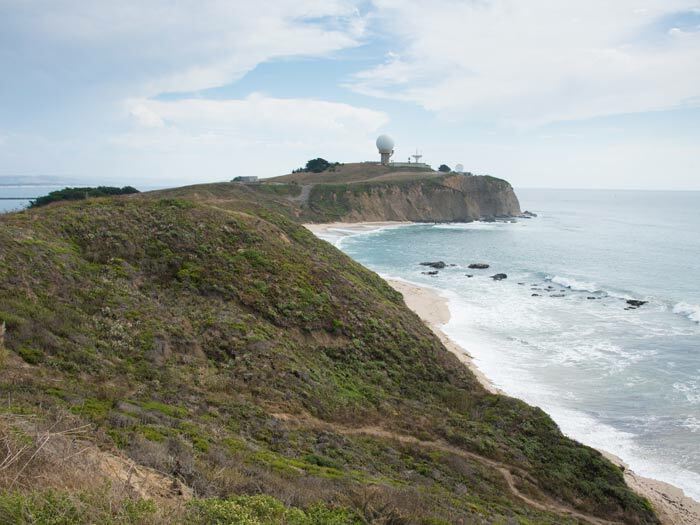 As part of the California Coastal Trail, it’s an important link in a trail system that will one day extend the length of state’s entire coastline. It also provides one of the best vantage points for the world-famous Mavericks surf break, where winter swells create some of the largest rideable waves on the planet. This dog-friendly (on-leash) trail is ADA compliant with a less than 5% grade and a hard, dirt-packed surface. We recommend parking at the Pillar Point Bluff parking area where there is ample parking and an accessible, ADA-compliant public restroom. From there, the trail crosses a seasonal wetland before ascending to the top of the bluffs. Stay right (north) to stay on the ADA compliant part of the trail, which continues along the service road until intersecting with Bernal Road. Bring binoculars so you can spot wildlife from the vantage points along this trail, even whales during migration season. Also, if Mavericks is breaking, it’s fun to watch the surfers brave the massive, winter waves. And, like everywhere along our coastline, the fog can be heavy, so be ready with extra layers. 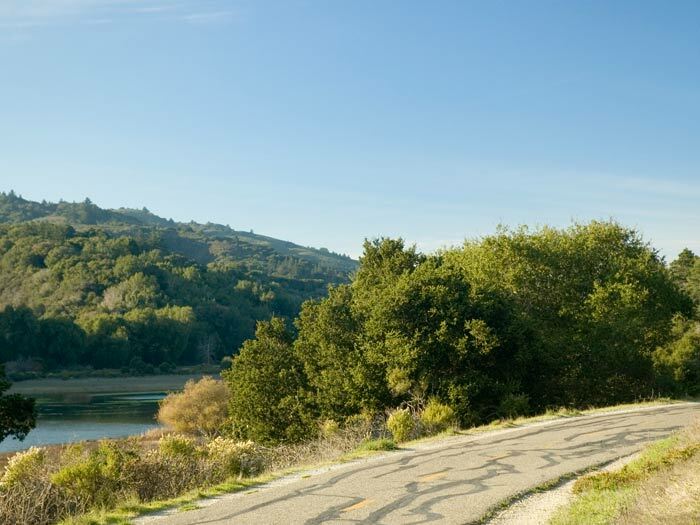 Overview: Follow a relatively flat, wide and winding section of trail adjacent to the Crystal Springs Reservoir with views of the POST-protected Phleger Estate to the south. Accessible Parking: There are two wheelchair accessible spaces at the trailhead on asphalt with a moderate grade. Accessible Restroom: The trailhead has an accessible vault toilet (no sink). There are two additional accessible vaulted toilets on the trail, one a mile in and the other just over three miles down the trail. This is arguably one of the most scenic wheelchair accessible trails near the urban areas of the Peninsula. Just off Highway 280, it’s one of the closest easy access trails in the area. And that’s no secret. On sunny, weekend days this trail can get quite crowded, so go early in the day if possible. Parking here is a little tricky. We suggest unloading at the trailhead and, if the two wheelchair accessible spaces are already taken, have one person find parking along Skyline Boulevard (which is very steep). There is a wheelchair accessible bathroom at the trailhead, but no running water. The trail winds above the edge of the Crystal Springs Reservoir and offers terrific views across the water and south of the POST-protected Phleger Estate, now managed by the National Park Service. Three and half miles in, you’ll find a rest area and another wheelchair accessible bathroom. From there you’ll be close the Jepson Laurel, the oldest and largest bay laurel tree in California. It’s a great place to take a rest before returning to the trailhead or, if time and energy allows, continuing north along the trail. The trail is named after Leland Sawyer, who back in the day ran a camp for wagon parties headed to Half Moon Bay from San Francisco. It is also part of the proposed Ohlone-Portolá Heritage Trail, a 90-mile recreational trail that will follow the route Gaspar de Portolá took on his 1769 exploration of the Peninsula, much of which followed ancient Ohlone Indian trade routes. Overview: Enjoy a stretch of trail that follows the edge of POST-protected Cowell Ranch with views of the surrounding farmland and Pacific Ocean. Season: All year, but the fall is particularly nice. Accessible Parking: Accessible parking spots are available within both parking areas, with van accessible parking at the southern lot. The surfaces are moderately firm, level with a slope no greater than 2%. Accessible Restroom: The southern trailhead has an accessible vault toilet (no sink). The Cowell Purisima Trail, just south of Half Moon Bay, is part of the California Coastal Trail which will one day span the entire rugged edge of the Golden State. It is, by far, one of our staff’s most cherished trails and for good reason. The views of the Pacific, pastoral setting and gentle grade make this one of the most enjoyable trail experiences on the California coast. Approximately 3.6 miles from one end to the other, the trail winds along cliffs above the ocean. There are a few bridges along the path that span seasonal creeks and many great places to stop to take in the views of the Pacific. 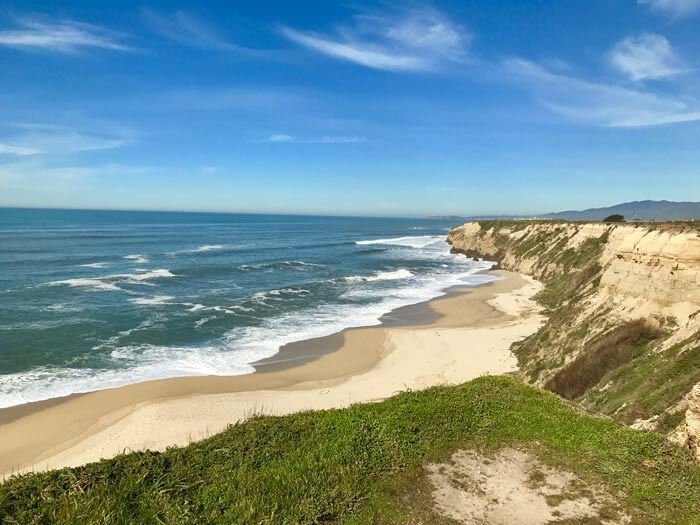 By far the best vantage point along this trail is found at the northernmost end of the trail, near the access to the Cowell Ranch Beach (see map below). This piece of land juts out toward the rugged coastline and offers expansive views. It’s worth the stop if you make it that way and is, in our opinion, a highlight of the San Mateo Coast. Most of the trail is wheelchair accessible, with the exception of some steep terrain in the middle of the trail where the trail crosses Purisima Creek (see map below). It’s a short section of trail, but the grade there is steep and not recommended for wheelchairs. We recommend that trail users pick an end of the trail (north or south) and make an out and back trip to this point, unless assistance is available to safely make it up and down this grade. See map below and please plan accordingly. There is parking available at both the northern and southern ends of this trail. The southern trailhead, has a wheelchair accessible bathroom and a space for a full-sized van. The trail and these parking areas are currently only open on weekends and holidays (8am to sunset). However, we’re working with our partners at San Mateo County Parks to have this trail open seven days a week within the next few years.